Quickly calculate percentage of body fat, BMR, BMI, and daily caloric intake. Is there a better alternative to Body Fat Calculator? Is Body Fat Calculator really the best app in Health and Fitness category? 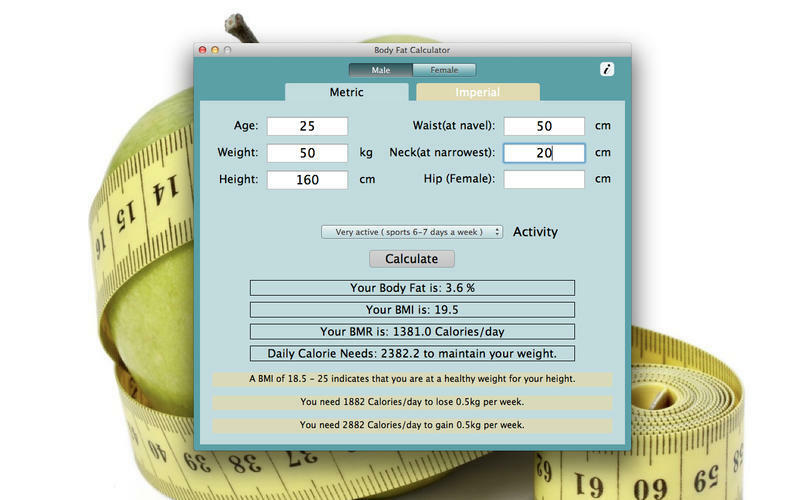 Will Body Fat Calculator work good on macOS 10.13.4? Body Fat Calculator needs a review. Be the first to review this app and get the discussion started! Body Fat Calculator needs a rating. Be the first to rate this app and get the discussion started! Body Fat Calculator helps you to quickly calculate your Body Fat percentage, BMR, BMI and Daily Calories. This app uses the height-and-circumference method used by the US Navy to measure percentage of your body fat. It is the simplest and fastest method for estimating your body fat percentage. After taking the careful and necessary measurements, formulas are used to calculate the body fat percentage. The BMI or Body Mass Index is used to give you an idea of whether you’re underweight, overweight, or an ideal weight for your height. It’s useful to know because if your weight increases or decreases outside of the ideal range, your health risks may increase. The BMR or Basal Metabolic Rate is the calories your body needs to function when you are at complete rest. Daily Calories can be used to estimate the calories you need to consume each day to maintain your weight. This calculator can also provide how many calories you may eat in order gain or lose weight.